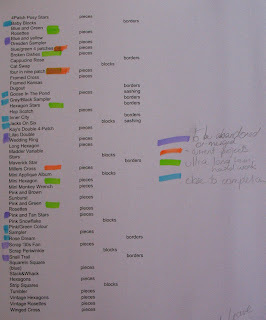 On Sunday I updated my spreadsheet of UFOs, and decided to rearrange it all. It's toooo depressing to look at it and see 76 projects, waiting to be worked on. I decided that I had no problem at all with my tops, I would happily have drawer fulls awaiting their turn on the machine. So I took all the tops off the list and put them into their own spreadsheet. That immediately took the number of UFOs down to 42. I KNOW! How can I have 34 tops? Don't ask. Then I went through and colour coded a heap of items; ones very close to completion, ones that could be abandoned, merged or just finished at the size they are, current projects and ultra-long-term hand projects. The current projects don't worry me; I am making steady progress on them. 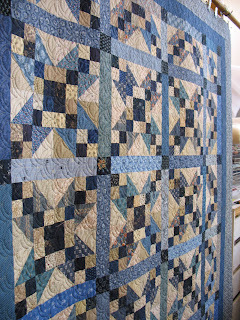 The ultra-long-term projects are all hand piecing that I am content to work on over several years. There are 7 things very close to completion, and 5 that couold be abandoned. So with a couple of weeks effort I could knock 12 UFOs off this list and have only 30 left. That means I would have cut the list in half after only a few months work. I know a lot of people would say my time would be better spent actually sewing, rather than mucking about with spreadsheets and highlighter pens. But it did have very concrete results. I picked out an easy project, only needing to be set together and borders attached, and 4 hours later I had this Rose Dream top in one piece. I wouldn't have touched it if the spreadsheet hadn't inspired me to make some progress on it. 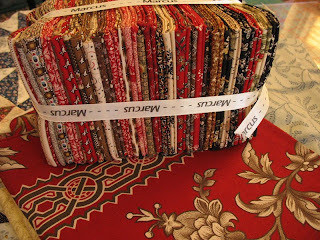 I probably would have cut some more fabric up, read some blogs and nothing would have changed. Like all my tops there is a story attached. 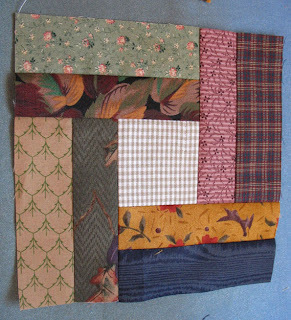 In 1994 I had a tantrum and refused to buy any more patchwork fabric. I didn't like what was in the few shops we had, it was over-priced and I thought it was contrary to the spirit of patchwork. 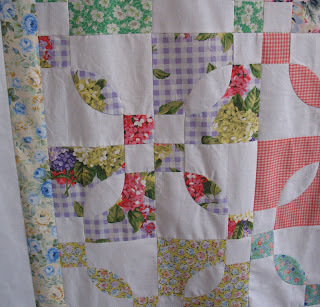 I went through a period of only making patchwork from the remnants of the dressmaking I did for my family. And I sewed all our clothes, so it wasn't that much of a hardship. This was made from scraps of my dresses and my DD's playclothes, and every block brings back a bunch of memories. Even ironing it made me remember the laundry detergent I used then! I had a lovely time piecing it together, by machine because I was too lazy to complete it by hand, and I'm thrilled that it's finished at last. 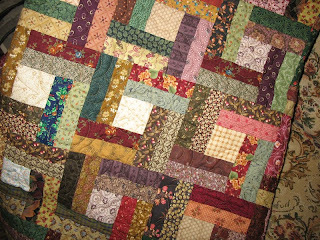 I will ditch-stich this on the Statler and quilt the blocks and border by hand, so I can relive lots more memories of those days. Another ancient UFO joined the pile of finished tops today. I pieced it 20 years ago, and it's been waiting for borders ever since. It took ages to hand piece, and all the edges were on the bias. That, and 20 years of being unfolded and refolded, made it a very dodgy prospect when it came to measuring for the borders. It will all quilt out. 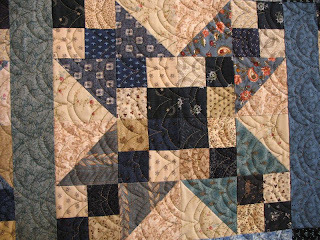 I love this star pattern, and I would make another one, but not by hand. I'm amazed at how many of my really old UFOs were abandoned at the stage of needing borders. But in those days we had no way of cutting strips for borders accurately. We didn't have wide rulers, or rotary cutters. I can remember buying a gigantic box of cereal that no-one really liked, just so I could cut up the box for templates for my borders. That sounds so old-fogeyish, like 'We had to unravel our socks for sewing thread....' Yeh Grandma. 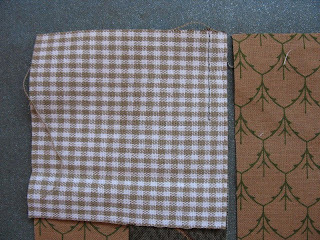 But I still appreciate the fact that I can cut my border strips in minutes, whereas once it was too difficult to contemplate. It still doesn't excuse the fact that my tops have languished in a box all this time, for the want of a half hour's work. I'm trying to get them all done. This diamond star is probably the third top that I ever worked on, back in 1979 (way back last century.) It was made with solid coloured headcloth, some pallid ditsy prints and unbleached calico. I was not enchanted with it once I started sewing in all those hexagons, and after a while the idea of putting any more work into it made me feel ill. When I departed to go to college in Queensland I left it behind, I never wanted to see it again. On a visit home Mereth proudly showed me the finished top; she thought I would be delighted to see it in one piece at last. 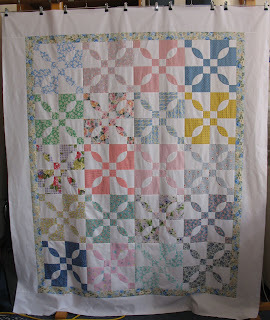 And then I felt horribly guilty that she'd put so much effort into finishing it (look at that hand-pieced border!!!) and I still didn't like it. I have some wonderful quilting planned for this, I figure if it's covered in feathered wreaths I might actually grow fond of it. Thank you Mereth! 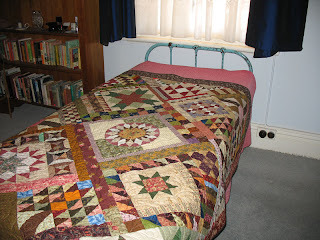 It's getting cold now, and last night I had two quilts on the bed and I still felt chilly. (I did spend the last 25 years in the tropics, I'm not used to this.) So I jumped up and got my Night & Noon quilt, which has a poly batting. It made all the difference. I love wool, and cotton, but poly holds the heat in so well. I have about 7 different excuses as to why I now have more than 30 yards of new fabric to find a place for in my workroom. It was the conversion rate, and that sale at Z&S, and, well dadgumit, I just wanted it. Judie Rothermel is my downfall; I just can't resist her fabics. I got the Rocky Mountain III and Cambridge lines as well. 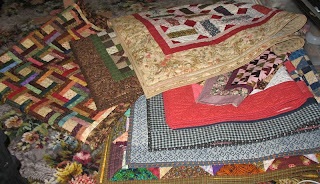 If I can't make a nice quilt out of this lot I should give up quilting now. 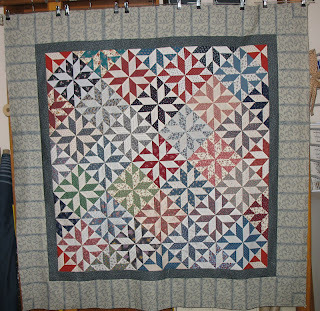 I finished quilting another top of mine, a pinwheel in reproduction fabrics that I finished sometime last year. I quilted it with a wineglass pattern, and it turned out well. 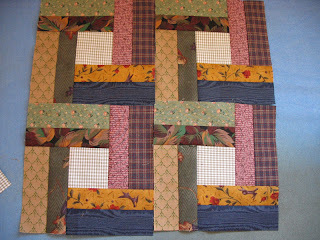 It was an easy pattern to place over the blocks, and it's in keeping with that time period. Sometimes simple patterns are the most appropriate. 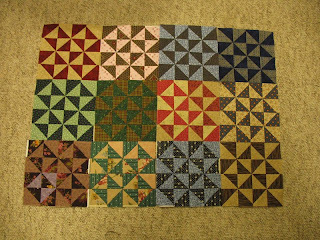 These blocks are the ones I'm making from the leftover triangles from the binding strips. 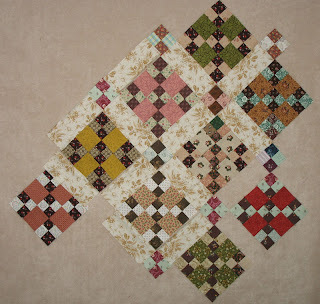 I have 12 blocks now, which represents 24 quilt bindings. That seems like an awful lot, but I have had a big finishing spree since getting the Statler. I was feeling pretty pleased with this lot until I noticed that I've sewn four as pinwheels and the rest as Broken Dishes. I can't believe I did that! Never mind, I intend to sash these blocks, so they won't touch each other, and maybe it will look 'charming' instead a big fat mistake! This collection of blocks will grow slowly, but it will mean a lot to me when it's finished. At the risk of sounding somewhat strange, this last photo is from the graveyard on a hill above Crystal Brook. On the night after the full moon we were driving Matt home along that road, and I decided to detour in and see if we could get photos of this lovely angel by moonlight. Alas, it was just too dark to get a good photo without tripods, which we hadn't brought. She is lit in this photo by the focussing beam from Matt's camera; bit of lucky timing that my camera caught it. We have agreed to go back on the next full moon with the right equipment and see what we can capture. Mereth sat in the car and squeaked nervously while Matt and I were taking our photos. 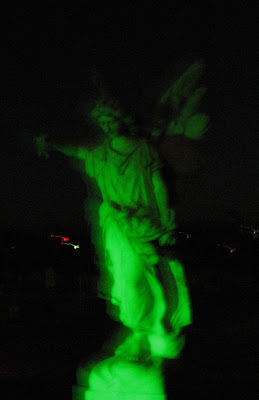 I think she and I were thrill-seeking teenagers the last time we visited a cemetary at midnight. 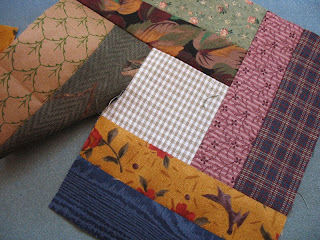 Several people have asked about the pattern for the woven quilt I showed in the montage. I have no idea what the official name is, but I call it Double Woven. It's dead easy to make, from one simple block. 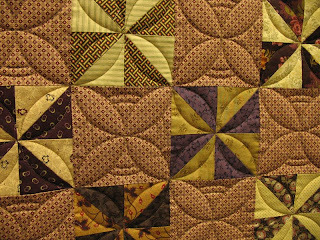 On the Stashbuster list there has been some discussion about simple piecing versus more complicated patterns; this is a nice step up from the easy stuff, but there's nothing difficult about it. It starts off with a partial seam, and if you've never tried that technique it's a simple block to learn on. 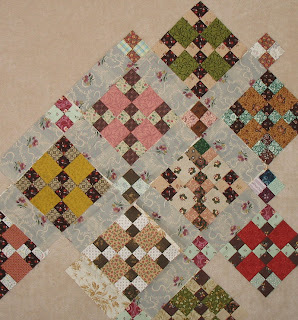 There are no seams to match except for the actual blocks themselves, and if your blocks turn out to be varying sizes you can trim them to size without affecting the overall look. It's a great intermediate skills project. I used all scrap for mine, but it would look great in a controlled colour scheme too. Every block is identical; keep the horizontal strips all aligned so that the dark is at the bottom, and the vertical ones so that the dark is at the right. I make a block to keep by the machine to refer to. This one isn't wrong, it's just rotated. One quarter turn to the right and it's the same block. Mine is built of 1 1/2" medium and dark strips joined together. This is really mindless piecing, just grab two bits and feed them through the machine. The seamed strips are cut into 4 1/2" slices. Put a light 2 1/2" square on top of one slice and sew half-way down. Repeat for however many blocks you are doing. Remember, all the dark sides of the slices should be in the same orientation. Finger press the partial seam towards the 4 1/2"slice and add another slice. Keep adding slices, then complete the seam you started with. Here's bits of the block being built. And four of them together. 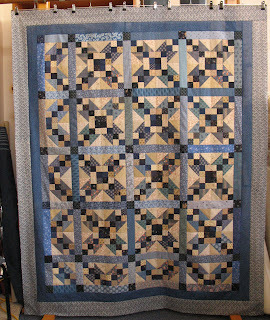 I love optical illusion quilts, and I always see great possiblities with this woven pattern. I have 10 or so variations in my sample box; just don't have enough time to work on them right now. My store website continues to grow, I'm plodding closer to completion on that. It's a lovely piece of software, and it will be great once it's up and running, but I have to build it all first. I'm so over computer screens right now. 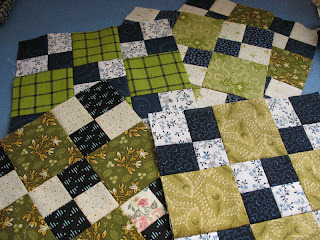 I've been sewing my blue and green blocks, but had a play with the nine-patches this morning. Wouldn't this be a spectacular quilt all on it's own? I love the variations possible with simple blocks; can't ever get tired of this game. 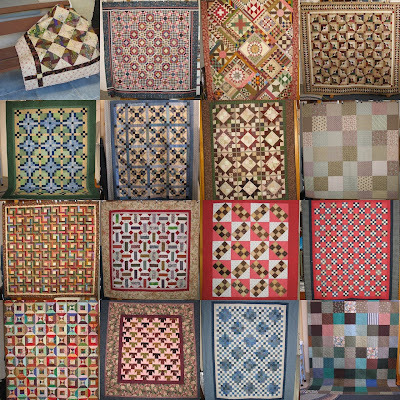 Just a few of the quilts I've finished this year. The mini T-quilt and the brown BearPaw variation are 8 year old workshop samples that I dragged all over the country without their bindings; what a relief to get them done at last. Several others will be written up into patterns or for magazines. Three were quilted before Christmas 06, and have sat on the shelf minus their bindings ever since. Never let it be said that I rush into things. 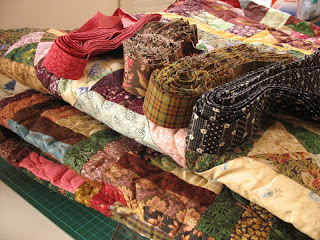 I'm climbing Binding Mountain again; I made 4 bindings this morning, trimmed all the quilts and assembled a stack of 8 quilts to be bound this weekend. These four already had their bindings made, which was a help. Once the day cools off a little I will put the walking foot on my machine and plod around the perimeter of all these. I don't mind binding at all, but it gets a bit tiring man-handling all that weight. By the time I get to number 8 my arms will be aching. 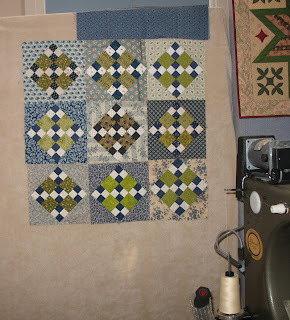 I've been working on my blue and green blocks, and have 12 finished and a few more cut out. I've just been making them with no pressure, using whatever fabrics I fancy. I have some pretty blue FQs that I have never dared use, I always think I have to 'save' them for something special. Well I guess this is it, because I'm finally cutting into them. If I use them all up, I'll go right out and buy those new pretty blues that I want. I even have the border picked already, and it's not that piece on the design wall; I think that will end up in the blocks somewhere. I'm enjoying playing with these precious fabrics at last. I love finding significant words carved or cast into objects, or painted on buildings. This was on the stove at the abandoned cottage; whoever built this stove cast his name and place of business as part of the product. 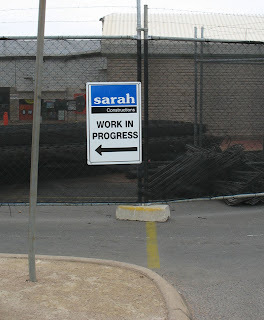 The rest of the writing was illegible, but the nameplace remains. One of the ways we cope with this heat is to get in the car and go for a drive. The A/C in the car is frigid, and it's nice to beetle about the countryside in comfort. 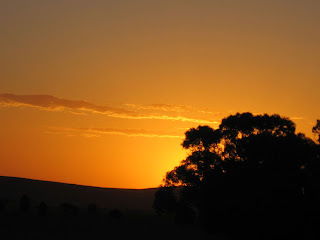 The other day we went for a trip to Wirrabera Forest, down a dirt road I haven't been on since I was 19. Wirrabera ( pronounced Wi-RAB-ra) is about 35k away, on the other side of the ranges. It's a huge radiata pine forest, and we often went there for picnics when we were kids. On the edges of the forest itself is this ruined cottage, and as it was so close to the road I hopped the fence and took some photos. It's just a shell, nothing inside anymore except a pile of timbers fallen from the roof. It had 4 rooms originally, and two good chimneys, which it would have needed in winter; this area gets freezing cold. There was a mulberry tree at the front door, and a fig tree at the back. It must have been wonderful to walk a few steps from the kitchen and pick the fruit. I think the early settlers planted their fruit trees so close to the house so that they could water them easily, and drive off the birds, and get some much needed shade. Figs and Mulberries seem to thrive on neglect, which I suppose is why they are often the only survivors around these old ruins. I liked the pattern of nails the carpenter made when he created this door. Very neat and tidy. And the old iron stove was lying out the back, rusting away to oblivion. I just love the deep reddy brown of this rust, so rich. I would like a length of fabric that looked like that. On the way home we went through Port Germein Gorge, which is 7k of twists and turns and amazing rock faces. It's not hard to see where the stone for the early buildings came from. These hills continually weather away, falling in huge piles of square rocks. Stone masons must have loved this stuff. 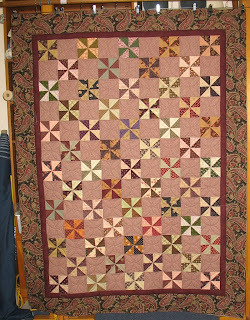 On the quilt front I have finally finished my green Periwinkle, that is entirely hand pieced, even the sashes. Mereth thinks I'm nuts, but it was enjoyable. I will baste it on the Statler, and hand quilt it over the winter. 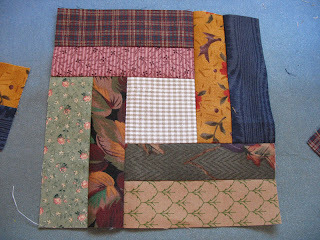 I'm presuming it will eventually get cold enough to hand quilt.I got the inspiration for this quilt from an illustration of a Grant Wood painting, in a quilt book. I was very taken with the woman hanging quilts on the line, and decided I would make one in that colour scheme and a similar pattern. I made the blocks quite large, at 9", because I wanted to use up more material; it was an early attempt at Stashbusting. I used up every last skerrick of a lot of these creams and greens, so it's a trip down memory lane to see some of them again. I'm going to enjoy quilting this. I braved the kitchen last night to do some baking; in between mixing and measuring and oven-checking I retreated to the air-conditioned computer room, so it wasn't too bad. 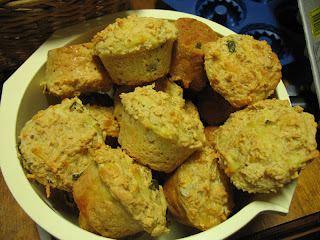 I try to eat lo-carb, and these are cheese muffins make with an Atkins baking mix. They are mighty good, especially with the addition of jalopenos and cayenne pepper and sunflower seeds. That's all my snacking taken care of for a week or so. 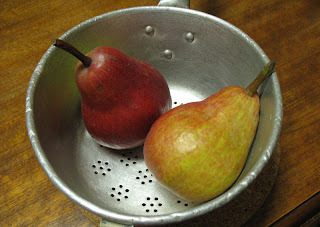 I'm not particularly keen on fruit, but these pears are appealing to me lately. They look like Delicious apples with an identity crisis, and sort of taste like that too. Very nice with a sharp cheese and a glass of wine. The colander they're in came from the op-shop; I was admiring it when the elderly lady running the shop told me that it had belonged to her mother, and she could remember it from when she was a tiny girl. Something in the way she said it made me think she was sad at having to part with it, so I brought it home. Whenever I use it I'll think of her as a little girl, and the mother who scrubbed it so clean repeatedly. What a lot of work it's seen over the years. And because we were a little claustrophobic the other evening, we set out in the car to go for a drive. We only went along the road for 20 minutes, then came back again, but it was a lovely outing. 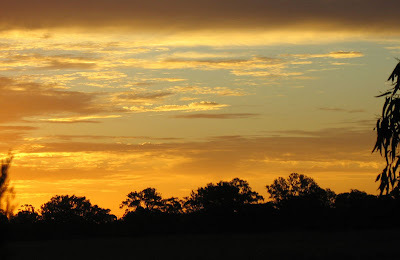 On the way home the sun decided to set in spectacular fashion, with the whole sky a blaze of molten gold. I love living in the country! The weather has turned hot and horrible again, and I'm trying not to lose patience as I wait for autumn to arrive. We need rain so desperately, I'm hoping some of the older trees make it through. It's dreadful seeing tall trees that have lived for 20 or 30 or 50 years come to grief in this hateful heat. And the rest of Australia is flooding! It makes no sense at all. On the way to pick up my sewing machine the other day we took an 80k detour to a fabric shop, to get binding for a customer quilt. The air-conditioning in my car is very effective, so it was probably a good day to spend driving. I may have bought the ends of about 7 bolts of fabric, nearly 8m total. However I only did it to help make room on the shelves; in this particular shop the shelves are so packed with fabric that it's a struggle to pull anything out, and damn near impossible to get it back. I did my bit to make some room. The bits I got are nothing rivetting, just useful backgrounds and borders and bindings. I feel positively Virtuous! And I cut up a load of fabric this week, so the total gain is only 1.4m. The Blue Anvil is in one piece, and I'm not delighted with the borders but at least I didn't buy fabric for them. This was supposed to use up all my blue-greys, and it did. It would have been ridiculous to buy more to finish it off, so I made do. But I think I might splurge on the odd metre of pretty blue, because my blue stash is woeful. Can you spot the mistake? I sewed this together without once standing back to look at what I was doing, and the little single corner block is rotated the wrong way. Not that I care; It's quirky. It so is! 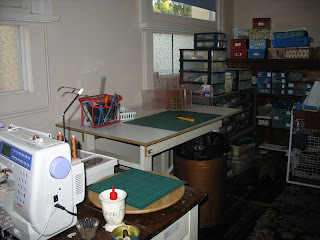 My backing cupboard is getting bare too, which is a bit frighteneing, as I have more than 20 tops to quilt. I think it's time I went shopping for backing lengths again. 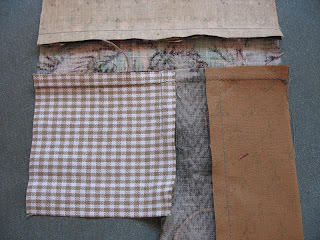 I don't know that I have enough expendable fabric left to make pieced backings. 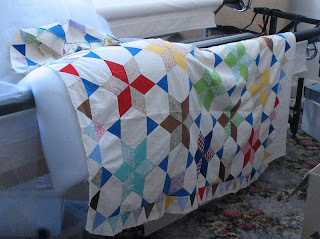 And the pile of unfinished quilts just got to me yesterday, so I did this. The Night and Noon, and Half & Half are totally finished. 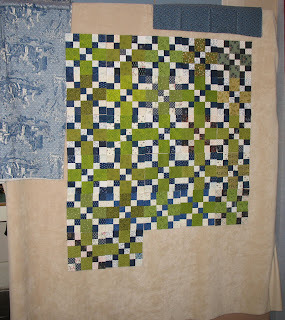 The Carolina Coverlet and the blue/green quilt have the binding attached and just need to be sewn down. Today I will have to put the air-conditioning onto frigid, but at least it will get done, and I can cross another 4 projects off the spreadsheet. Yay! 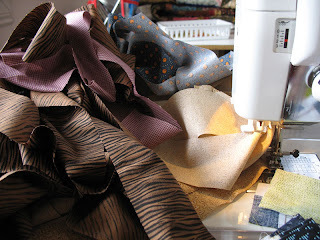 There is not a great deal to report on the sewing front; I am chained to the computer for the forseeable future. I'm starting to enjoy what I'm doing; designing a new website, tidying up my taxes, making the initial files for a new computerised quilting system that will hit the market later this year. It's all quite exciting, but exhausting too. Lots of late nights and brain fades, when I just can't make sense of one more new process. I know it's supposed to keep you young, learning something new, but it makes me feel old and weary when I do too much. I never had this trouble when I was 10 years younger.... 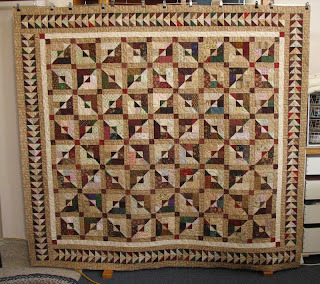 In between other chores Mereth quilted my Half & Half quilt, and I love how it turned out. It fits the bed nicely, and looks good in that room with the rich red walls. That Flying Geese border was so worth the effort. The panto is one of mine called Limetree, and it makes a nice swirly, leafy texture. It's not a new one, I've used it several times and I like it every time. We did this at 10 1/2 inches, and it went quickly, but covered the top well. Gotta love that. I think I will make some time to do a little easy sewing on the weekend, I've worked hard this week and I deserve some free time. 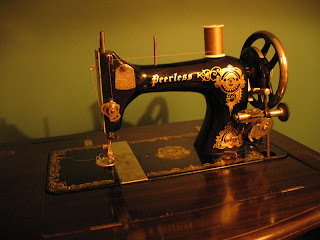 Maybe I'll do some sewing on my latest machine, a Peerless treadle in excellent condition. I just had to rescue it from the junk shop where it was jammed in behind a stack of other furniture. I spent a bit of time this evening cleaning ancient lint and grease out the moving parts, and sewed a few seams to make sure everything worked as it should. What a little gem. We had a power blackout that lasted 5 hours a few weeks ago, and it was awful not being able to sew. My other treadle isn't up to scratch when it comes to making a nice stitch, it needs some work. But this one is ready to go. This is what I did this afternoon, once I had all the Anvil blocks joined together; it took a while to find the table top, and even longer to sort away all the random scraps, but I kept at it. Now I feel really tempted to start cutting a new project, but I'll be good and work on my UFOs. The Anvil top needs borders before I can call it finished, so that will be my first task. Unfortunately I've cut my blue stash so drastically that I'm going to have trouble finding anything suitable. I may have to BUY something. 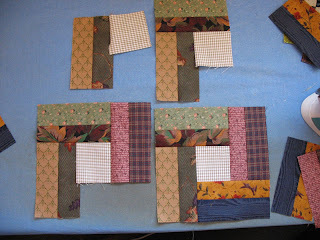 Then I will start cutting the sashing for these scrap blocks, and sewing them together. 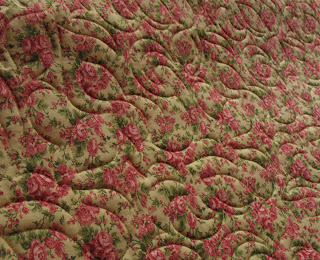 I really like this yellow floral fabric, but there's a blue that looks lovely as well. Come back tomorrow and you'll see which one won out in the end. I didn't get the binding finished on the Carolina Coverlet, but it will wait patiently till I get round to it. 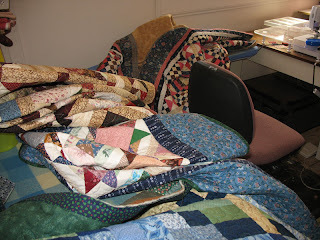 The weather is a bit warm today , and I didn't want to be sitting under several square metres of quilt for an hour or two. But the Orphans and Siblings is on my bed, ready for autumn weather. 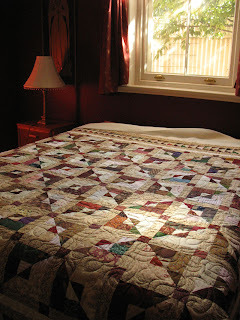 I'm planning to make a wholecloth quilt to replace my antique English quilt; it really is far too good to use every day, but I've enjoyed having it there on the bed for a couple of months. It can go live on the spare bed now and be treasured instead of used.